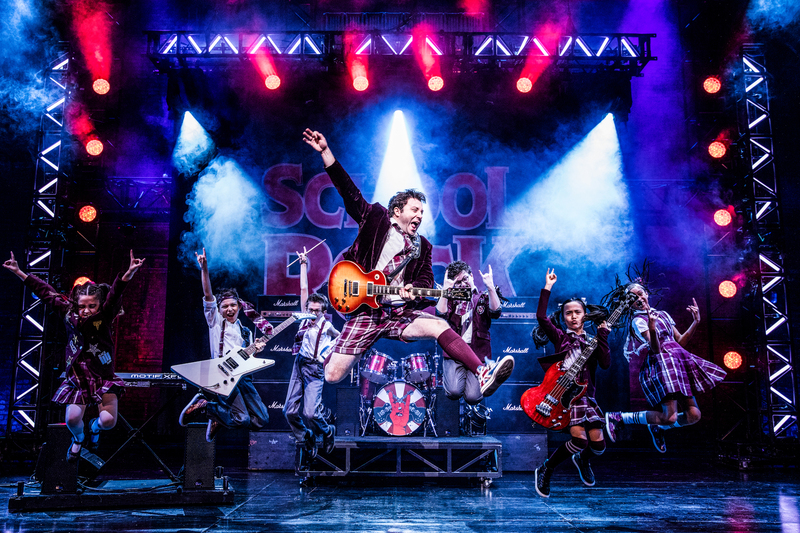 I started School of Rock wondering if they could turn down the volume, and perhaps if I’m a bit too old for this rock and roll (get off my lawn!). But by the end of the show, I was in the audience at the Battle of the Bands, yelling for an encore and whooping after the solo riffs – all on a school night. The performance opens with Dewey Finn getting kicked out of his rock band, losing his chance to compete in the Battle of Bands. He gets fired from his job and his roommates demand that he pay up on his late rent. To make money, Finn impersonates a substitute teacher at the prestigious Horace Green Academy, a job he is in no way qualified to fulfill. There, he quickly realizes that his students have musical talent and prepares them to be his new act for the Battle of the Bands. School of Rock is the journey of these students as they grow in musical talent and self confidence, shedding the rigid expectations of their helicopter parents and uptight school. Although the story is based around Dewey Finn, played by Merritt David Janes, the real stars of the show were the kids and they outshone every adult on that stage. The actors are between the ages of 9 and 12, and yes, that really is them shredding live on stage every night. These tiny actors created believable, honest characters, and I found myself relating to their struggles of being heard by adults, finding their own identity, and trying to be cool. You may remember the 2003 movie version starring Jack Black, upon which the musical is based, and it felt as if Merritt David Janes tried to be Jack Black playing Finn for much of the performance. It wasn’t until Act 2 when Janes really arrived, shedding his Jack Black affect and bringing his own dynamic persona to the role of Dewey Finn. The production value of this show is high. Although there are only three distinct sets – the apartment, the school, and the Battle of the Bands – the transition between them was smooth and impressive. The drum kit rotated into the apartment scene, while whole segments of the set receded into the back as the walls of school flew in. Even the movement of desks in and out of the scenes was a choreographed ballet. Broadway’s Best Party Returns to BALTIMORE!